I was quite impressed when I heard that Brazilian President Dilma Rousseff concluded her first year in government a few days ago with an approval rating higher than that of her predecessor, the charismatic Lula da Silva. Her popularity is currently close to 75 percent. Her government’s approval is at 56 percent, which is even better than the 51 percent Lula had when he finished his first twelve months in office. I believe this is a result of her image of being intolerant towards corruption and providing sound economic management in times of global crisis. 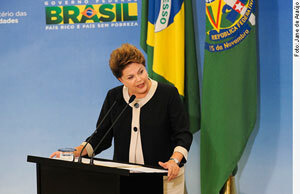 The economy aside, it is interesting to look at the public perception of Rousseff’s strong stance against corruption. Rather than being negatively affected by the fact that she was surrounded by corrupt public servants holding some of the highest positions in her cabinet, the public seems to reward her for separating herself from them as soon as allegations come to light. In the space of only six months, six ministers lost their jobs amid various corruption scandals.